Throughout the Bible there is a thread from Jacob’s ladder to Joseph’s grain, from Daniel’s four beasts to Joseph and Mary, right through to Paul’s man from Macedonia and even to Mrs Pontius Pilate. What’s the common thread? They all had dreams sent by God. God warned people, encouraged people, gave direction to people through dreams. So why doesn’t he still do that? Well according to my friend and retired Anglican Minister Malcolm Nicholas … he does. It’s Thursday night and I am dreaming as I sleep — its content I remember clearly upon awakening. I have “seen” a room I instantly know to be the sitting room in the bungalow home of my parishioner Elaine who lives with her twin sister. Admittedly its appearance has significantly changed. Last time I visited here, the room was over‐crowded with two three‐piece suites, the sisters’ aged mother having recently moved in. In my dream neither suite is present — instead the room seems filled with beds. I sense that something is amiss, and resolve to visit when I can. However I am working today (Friday) and on call to the hospital on Saturday — it looks as though a visit must wait until Monday evening. Sunday comes and Elaine is not in church. This is almost unheard of unless she is ill or on holiday, and I sense the visit must not be delayed. Calling that afternoon, I am welcomed, fed with tea and cake, and entertained with pleasant conversation. All seems normal (the sitting room has no bed and just the one suite) and I resolve to make my excuses and go home. As I do so Elaine says “Our brother is very ill. He’s come to stay with us. He’s in the next room. Will you come and see him before you go?” I did not know they had a brother, let alone that he was ill. I am led into one of the bedrooms where he is in bed, floating in and out of consciousness. I take his hand, spend a few moments in quiet, speak briefly of God’s loving care for him, and pray audibly. I sense that he is aware of my presence; I cannot judge whether he knows who I am or anything I have spoken. I give him a blessing and make to go home. I do not know then that he will die before the day is out. “Of course”, says Elaine as I leave, “with mother in one bedroom and our brother in the other, each night we have to make up a bed in the sitting room”. At one level this account speaks for itself. I had been briefed by divine intervention, and sent on a mission in the nick of time. Such interventions have been infrequent, but this is by no means the only occasion. Remembered dreams should not be lightly dismissed. Not infrequently I have found that the ‘half asleep / half awake’ period before rising is a time when I have been receptive. Equally there have been occasions when driving around the parish there has suddenly occurred to me a sense that I should call upon a particular house to be greeted with “I’m so glad you’ve come; I was just thinking about you …” and a conversation opens in which the reason for my call soon becomes apparent. Of course there are those who refuse to accept that such divine occasions are divinely inspired. Among Elaine’s family there were some who offered an alternative explanation: “… our brother was calling out to you…” (even though he knew nothing of me!). But for those of us who trust the divine nature of such events, there is powerful evidence here of God’s love and care in action. I knew nothing of Elaine’s brother’s faith or lack of it (it was not evidenced through any regular religious practice). Neither did I know what may or may not have taken place between him and God in the privacy of his dying day. I can bear witness to one thing and one thing alone: God made his plight known to me, and I was at that moment His messenger of love and care. If you enjoyed reading this, try Is prayer the same as prayerfulness … the same as mindfulness? This article is one of many short pieces from the working life of a minister recorded by my friend Malcolm Nicholas. Malcolm has spent thirty years in ministry and still leads spiritual retreats at The Northumbria Community. 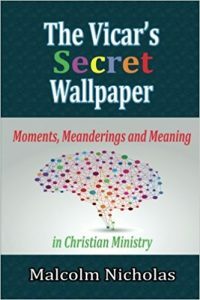 You can find the complete set of his gentle, hilarious, and profoundly moving moments in Christian ministry in his book, The Vicar’s Secret Wallpaper from which this piece is reproduced with permission. Thanks — enjoyed that — and very easy to read! I don’t dream often, do you? Not sure. I understand that we all dream every night but, like many, I find it hard to recall a dream unless I wake in the middle of it. Even then its hard to remember next morning. I do know people who can recall dreams almost every day and I think I remember being better at this when I was young, so maybe its something we can lose as we grow up? Thank you Malcolm and Chris. A timely reminder that God is intimately interested in every aspect of our lives and can intervene whenever he so wants.